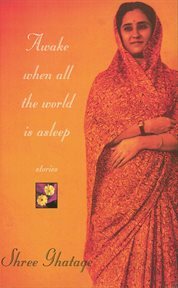 The item Awake when all the world is asleep : stories, Shree Ghatage, (electronic resource) represents a specific, individual, material embodiment of a distinct intellectual or artistic creation found in Austin Public Library. A young Indian woman studying medicine in Winnipeg visits her home in Bombay and discovers her parents are planning an arranged marriage. Suddenly Winnipeg, which she does not like, looks much more attractive. One of eleven stories in a collection. Thomas Head Raddall Atlantic Fiction Prize, 1998.